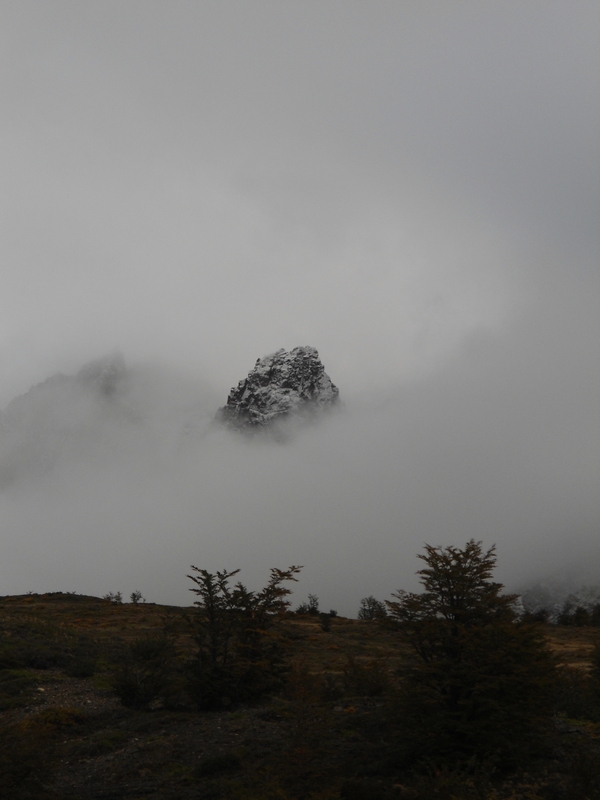 From El Calafate, we took a bus south across the border to Puerto Natales in Chile. From here we planned to do the “W” trek (named after the shape of the route) in Torres del Paine national park. The first thing we did when we arrived at our hostel was put up the tent that we’ve carried round with us for 6 and a half weeks to make sure the bits were all there. They were but seeing as the top sheet barely covered the ground sheet, we decided it probably wasn’t up to autumnal Patagonian weather. With hindsight we probably could have guessed this as the tent said “Beach” in huge letters on the bag but on the plus side we did manage to sell it for CH$10,000 which has enough zeros to make it sound like a huge amount of money! The next morning with our rucksacks filled to the brim (each weighing 20kg) we took a bus to the park then a boat across Lago Pehoe to Paine Grande campsite. Here we took a risk and hid some 4kg of our food in the communal kitchens as we’d be returning here on the night of day 2 and began the trek. After a nice bit of flat through a valley we began to climb. And climb. And climb. After about 2 hours we reached the top and were rewarded with amazing views of Glacier Grey in the distance and lake in the foreground, milky ice blue from melted glacier ice. 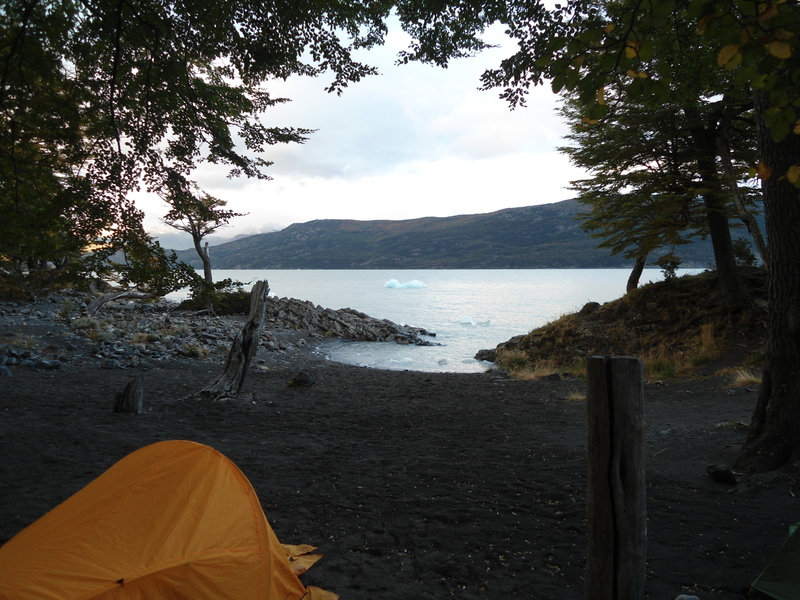 A few hours later we arrived at Refugio and Campsite Grey and we pitched our tent in the drizzling rain on a sandy beach as icebergs that had broken off from the glacier floated by. As the sun set, we snuck into the refugio and warmed ourselves around the wood burner. Much to my surprise, this, combined with my leggings, resulted in a very reasonable night’s sleep. The next morning we hiked a short distance to a mirador (view point) over the glacier but didn’t stay long as it was beginning to rain. We then retraced the 11km we did on the first day and camped at Paine Grande. Fortunately the food we had stashed away was untouched so we weren’t going to have to go hungry for the next few days. 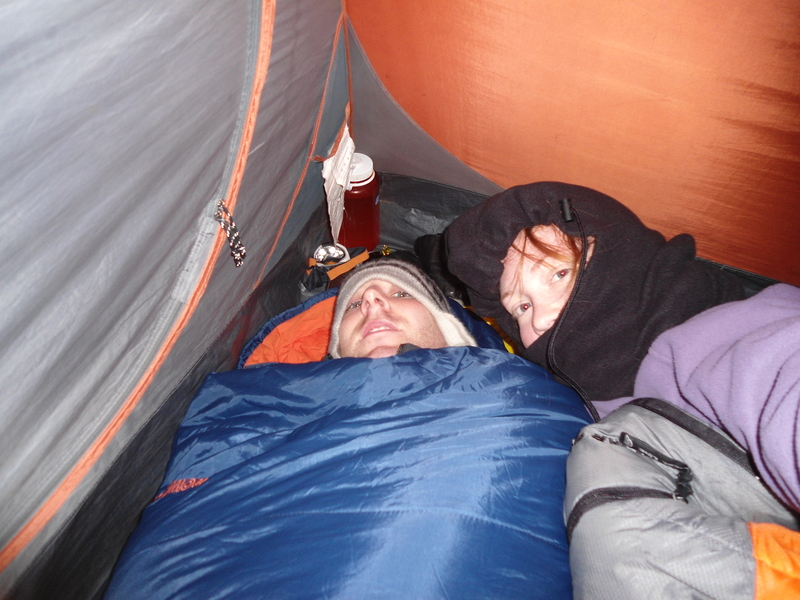 Although that day had been mainly dry, that evening, the temperature dropped significantly and without a refugio with a fire to warm us up, we put all our clothes on and snuggled together to try to get some sleep. It turned out to be a long and painful night and it was only after the sun rose that we realised that the ground sheet and our sleeping bags were damp. Porridge with loads of chocolate melted in it perked us up and we set off east towards Valle Frances, which we’d been told was the most beautiful part of the park. Our plan was to drop our bags off at Campsite Italiano and head into the valley for lunch before returning and pitching camp a couple of hours further along the route. Unfortunately the weather was not on our side. Clouds and mist came down, the temperature refused to go up (we later found out that it peaked at 3⁰C) and the rain just got heavier and heavier. After a brief excursion into the mist in Valle Frances we turned round and powered on through the rain to Refugio and Campsite Cuernos. The sight of 2 collapsed and waterlogged tents caused us to take the easy option and take 2 beds in the refugio. 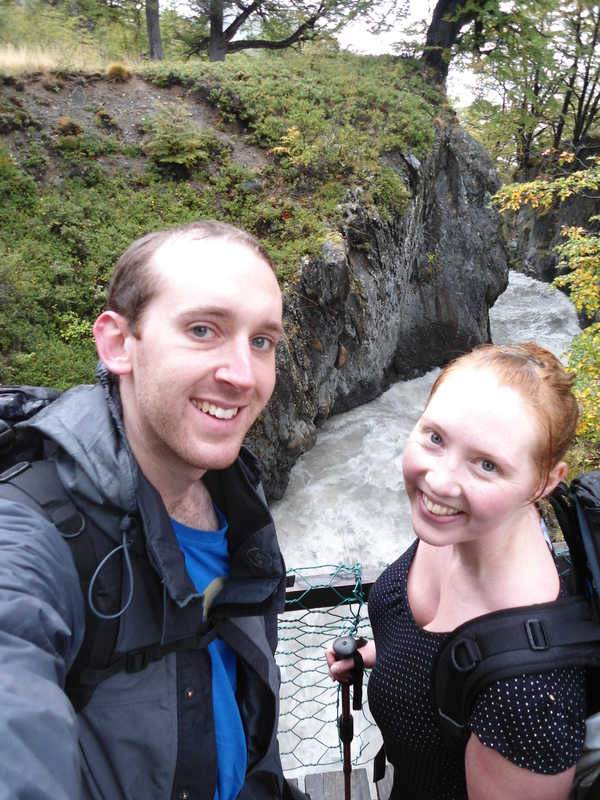 Being warm and dry was heavenly but the weather did not improve the next morning and Claire began to struggle with the hills and the weight of her pack. We reached Hotel Los Torres at lunch time where we planned to drop our bags and hike 6 hours there and back to see the famous Torres, stay 1 more night and then get the bus out the next day. However, speaking to some people who had been up to see the Torres that morning but had been unable to because of the mist, combined with Claire’s dislike of the hills and my dislike of damp sleeping bags, we cut our losses and took the bus out of the park that day. We were frustrated that we hadn’t seen the Torres which are supposedly the star attraction of the park, but looking back, walking almost 50km in 3 full days trekking while carrying nearly 20kg each in some really unfavourable weather conditions really doesn’t sound too bad. So we decided to celebrate with a cheeky little steak, a bottle of Merlot and a plan to fly north to get some sun as soon as possible! Love the photos, brings it all to life and the scenery is amazing. Seems a lot of focus on food, is this a recurring theme?